Yesterday I downed tools at lunchtime in favour of a surf at Spot G. It was about shoulder high, clean, sunny and uncrowded. In the water was Aerial Attack and a couple of others; on his way out was Jonty Henshall. I hadn't surfed for a few weeks and was soon exhausted, but had enough waves to see me nicely stoked. It was my birthday (46, good grief) but all things considered, it was as fine a way to spend a birthday as I could have hoped for, let alone one which pushes me solidly, not to say rotundly, into middle age. More waves later, perhaps, but meantime be sure to check out the Surfing GB website and join up. The more people who get behind British surfing's revamped and reinvigorated governing body the better. And if you'd like to help with raising funds for the junior team's imminent trip to the World Championships in Panama, well, that's even better. Lastly, and once again: apologies to everyone who received an email from me suggesting that they join WAYN. I clicked on one such email, from a trusted source at The Guardian, but lo and behold somehow invited seemingly everyone I've ever emailed to join up. This was inadvertent, and from what people now tell me it appears that WAYN is some kind of dating site. Who knows, maybe it'll bring you joy, but if, like me, you regard it as nothing but spam, apologies for my role in inflicting it. Nice pic of Sennen Cove on not so sunny a day as yesterday courtesy of JonasPhoto. Don't forget to vote for SAS but meantime, there's an interesting piece in The Economist on ... surfing. No byline, because of the magazine's policy of not naming its writers, but seems well-informed. Click here for a read. Surfers Against Sewage needs you. Vote now! OK everyone, here's the deal. The good folk at SAS need your vote to secure a much-needed tranche of funding from the European Outdoor Conversation Association. The link is here and time is running out. Please vote. It's been a while since I posted owing to absorption in research/writing my next book. I'm here now because of blasted sciatica in my right leg. It's 1.40am on a Sunday morning and sleep has proved impossible for the past two hours. If anyone has ever had sciatica, they will know just how hideous it is. Waves of pain arrive out of nowhere, travelling from your buttocks, down your thighs and into your knees. Apparently they can can also travel round to your groin and down to your feet - so clever are these particular waves - but in my case it's solely a case of right buttock and outside of the right knee AGONY. Yes, that's a big word, but when sciatica is bad it really is agonising. I have a stash of Co-Dydramol and Tramadol for when the neck flares up. Tramadol is the stronger. I took two Tram two hours ago. The result? No difference whatsoever. Now then, in the great scheme of things a bit of sciatica is, as some lawyers like to say, de minimis. Worse things happen at sea, we who suffer from sciatica should wake up and smell the coffee, life is for living and making a bad decision is better than making no decision at all, so at least, in deciding to take a deuce of Tram, I made a decision, perhaps a bad one, who knows, but all things being equal, and they sometimes are, the chances are that I will wake up later this morning, having been duly zonked by the Tram, and then, shortly thereafter, once I am awake, I will smell the coffee. Life being for living, I will get on with it, reassured that as they day unfolds I will see plenty of the sea but that I won't be on it, or in it, where worse things happen, including bouts of sciatica, maritime sciatica surely being the worst kind of sciatica, something truly evil and hellish, talking of which, my poor father has exactly the same spinal complaint as me, only in his lower spine and not his neck, and currently finds himself, at the age of 71, tip-toeing around pre-op, hoping that he is not jolted in any way and labouring under precisely the same kind of sciatic bouts as me, his son of 45. As anyone who has read Wrecking Machine will know, my father and I have had our differences. In recent years, however, we have enjoyed a loving and congenial relationship, and now here we are, united in spinal disarray. Dad has sciatica every night. He is probably awake as I type this, in the same kind of pain as me. It is a strange world, the sciatic one, and it doesn't involve a lot of surfing. Image courtesy of Tim & Selena Middleton. 1. Join Surfing GB. Surfing GB is heading for formal National Governing Body status and even in its interim stage is, in effect, UK surfing's governing body. It's had its fair share of problems over the years but an incredible amount of hard work by a dedicated group of people now sees Surfing GB revamped and doing a great job. There are membership benefits to joining but you'll also be making a small but vital contribution to Surfing GB's funding and continued survival. 2. Vote for SAS in its battle to secure funding from EOCA. 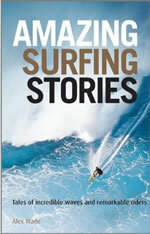 SAS needs no introduction and is hugely respected by surfers and non-surfers alike for its sterling work. Every vote counts and it only takes a minute or two, so click this link and cast one for the St Agnes based campaign group. 3. Check out the Museum of British Surfing when it opens its doors on April 6 (Good Friday). The Museum is at The Yard, Caen Street, Braunton, North Devon EX33 1AA. That it exists is down to one man's incredible perseverance and passion - step forward, Pete Robinson, the Museum's director and a former award-winning ITV News reporter. Its inaugural exhibition is ‘The Art of Surf’, a display of 200 years of art in surfing from the sketches of early explorers through to works by contemporary British surfing artists. Among the modern artists featured will be Conrad Shawcross, Ben Cook, Mark Haywood, Al Lindsay and Maria Rivans. I'm stoked to see that Pete's years of hard work have paid off, and will make my way to the Museum as soon as I can, not least because I'd like to find out more about the suggestion that Agatha Christie was a keen surfer back in 1922. Perhaps it's even a fact? Pete, and the Museum, will know. Image courtesy of the Museum of British Surfing. Damn! In trying to delete some spam, I pressed the wrong button - twice. Apologies for anyone who cherished them!